After the heart stone is stolen from the evil Fox by the bumbling, flatulent Ratboy, it finds it’s way into the hands of a young boy, Kenta. First Kenta’s father and then Kitaro and his motley band of monsters are accused of stealing the stone, as the Fox fights to have it returned. This sparks a chain of confrontations as the parties fight to find the stone(which Kenta is keeping hidden after promising his father). The seemingly convoluted plot, involving quite a cast of characters and numerous twists and turns, is told straightforwardly and moves quickly from scene to scene. And despite it’s flimsy nature the plot is relatively gripping. The special effects vary between low-budget costumes and make-up and digital effects. While nothing special, they don’t detract from the innovative characters, of the likes of Catgirl, The Sand-Hag, Ratboy, and Uncle Eyeball The style of the film is light considering the subject is ghouls and monsters, having the feel of a children’s Halloween party, rather than a more sinister atmosphere as in some of the manga. The film is aimed squarely at children and contains enough physical humour and excitement to keep them entertained. At it’s heart it’s a film about the bond between a father and his son, and the transitions between the comedic moments and family drama, in particular a moving scene towards the end involving Kenta and his father, are done well. 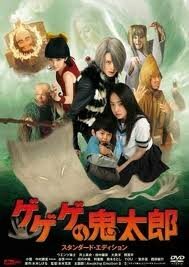 Based on the Manga and subsequent Anime series by Shigeru Mizuki.